For football fans who like to try more interesting fixed odds bets, Betfred offers Goals Galore in their coupons to raise the odds and the excitement! If you want to know how this type of betting works, you need to read this article before you play. That's because you are going to learn how to get more from this game than most people do by using some simple yet powerful techniques to boost your winning chances! The principle involved in this game is a fairly simple one in that you need to choose games where you believe both teams are going to score. It happens all the time when both teams in a given match end up scoring at least one goal apiece and often more than that. So how great would it be to be able to place a bet on say three or more matches that you have a strong gut feeling will see each team scoring one or more goals? Well now you can with Betfred and their Goals Galore game! Each week, you are presented with the coupon containing a long list of matches from top European leagues including the English Premier League, Spain's La Liga, France's Ligue 1, Italy's Serie A and Germany's Bundesliga. These matches are chosen from Betfred's Bonus and Long List coupons. All you need to do is choose three or more of those matches and place a tick in the box by each of your choices. If the final score for your selections has both teams in each match scoring at least one goal each, you win at the odds printed on the coupon. For example, say you chose three Premier League games that you were familiar with and had a pretty good idea of their current form. If the odds offered for three correct choices is 3/1 and you bet £100, you win £300. It's that simple! Now let's say you choose five games where the odds rise to 10/1. That £100 bet will now net you £1,000 in profit, which is not to be sniffed at. All for using your knowledge of the selected teams and knowing the likelihood of each team's scoring chances based on their recent goal scoring form. I'm pretty sure just about everyone who plays this will want to know what they can do in order to maximizes their winning chances and you're probably no exception, right? Well there are couple of things you can do to really boost your chances of picking teams that are more likely to produce goals. Know your teams: Study the form closely over the past few weeks and see how often each team has scored and against what kind of opposition. Know the players: Then drill down deeper and look at individual players to see how they are performing in their respective teams each week. Just these two things can net you a lot of money when you do your homework and make it your business to know what each team is currently playing like as well as how each player who is playing in a goal scoring position has been performing. Just remember that players are human beings and not just icons on a handicapper's board. You will get to know a team's main strikers and scoring midfielders by studying them. When it becomes pretty plain that some players are scoring more freely than others while their teams are playing the kind of strategies that are conducive to goals being scored, these are the ones to go for. Remember, you don't need to pick teams that are winning all the time, just the ones that have players who are scoring! Now that you know how to pick winning matches, why not have a go for real by signing up with Betfred Sports and placing some bets? Click the advertisement below and make your wishes come true! 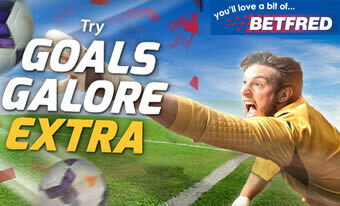 Click HERE to get started with Betfred Goals Galore NOW! PS: When you know what you're doing, you can join that small percentage of bettors who are consistently winning and making a living from their knowledge and ability to do the research and apply it!